In the zone fill-type reservoir embankment, the vertical filter for drainage is essentially installed, but in the case of the horizontal filter, the applicability is determined by the reservoir’s scale or the importance grade of the facility. In particular, horizontal filters are not installed in small reservoirs (with a height less than 30 m) which have lower risk compared to large embankments due to the high price of the filter. However, recent climate changes are increasing the structural instability of small-scale embankments, hence requiring a way to ensure additional stability, to cope with them. Hereupon, installing the horizontal filter at proper spacing on the embankment is an efficient method to improve the structural stability of the embankment and minimize costs. However, current design standards relating to horizontal filters face the problem that the range for the filter installation interval is too wide and does not reflect actual risks, such as piping. 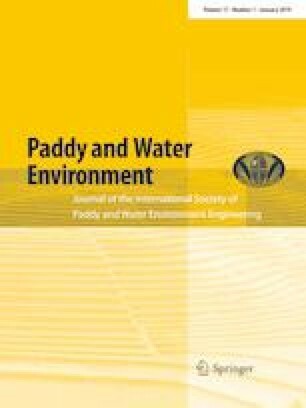 Therefore, in this study, a model experiment was carried out based on the actual embankment to investigate the seepage characteristics and the range of stability variation according to the horizontal filter interval conditions. Experimental results show that there is an interval range of the filter where the dissipation of pore water pressure occurs in the core zone. The core zone is the most important structure to maintain the stability of the embankment, suggesting that the determination of the filter interval should be based on the consideration of the dissipation of pore water pressure in the core zone. This research was supported by a National Research Foundation of Korea (NRF) grant funded by the Ministry of Science, ICT & Future Planning of the South Korean Government (Grant No. 2016R1C1B2013181).